A video assist (video tap) is an accessory for a motion picture camera that provides a video feed from the camera lens. It is used to allow the director or operator to see on a video monitor or computer screen what is in the camera's frame without having to look through the viewfinder, as well as allowing video to be captured that can be used to create an immediate rough cut, if needed. If the motion picture camera runs at a frame per second rate (e.g. 24 fps) different from the video frame rate, NTSC: 29.97 fps, PAL: 25 fps, then the monitor image will flicker. The flickerfree video assist is designed to produce a 100% flickerfree monitor image for camera speeds ranging from 10 to 150 fps. A Sony CCD (Charge Coupled Device) solid stage EXview HAD (Hole Accumulated Diode) image sensor provides it with high resolution, high sensitivity and outstanding color fidelity. 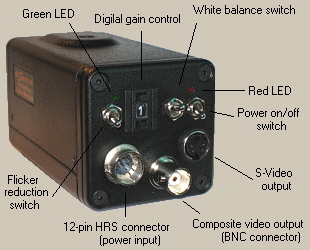 The computerized video assist electronics allows the image to be electronically flipped horizontally and/or vertically, which is useful when operating the unit with various video optics systems (different cameras, e.g. Arriflex or Aaton). This video assist can be supplied from a 12V or 24V battery (autoranging) and is equipped with a noise filter which provides a clear monitor image even if the camera motor is noisy. The low power consumption, only 220mA/12V or 130mA/24V, gives your camera battery a longer life. This flickerfree video assist can be easily mounted to Arriflex cameras. - When set to the lower position, flickerfree mode FF is activated and the green LED is lit. This mode is designed to produce a flickerfree image for camera speeds ranging from 10 to 150 fps. - When set to the middle position, flicker reduction is off and the green LED is not lit. The video assist is in normal mode. NTSC - When set to the upper position, flickerfree mode FF30 is activated and the green LED is lit. This mode provides a 100% flickerfree image when operating at a camera speed of 29.97 fps or 30 fps. In this mode, flickering is reduced by 70% for camera speeds other than 29.97 fps and 30 fps. PAL - When set to the upper position, flickerfree mode FF24/25 is activated and the green LED is lit. This mode provides a 100% flickerfree image when operating at a camera speed of 24 fps or 25 fps. 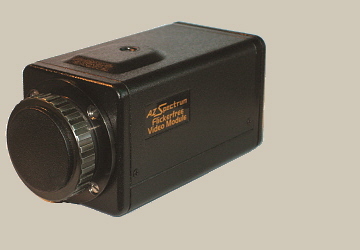 If the video assist is powered from the camera's accessory connector, flickerfree modes FF , FF30 (NTSC) and FF24/25 (PAL) will only be active when the camera is running. Once the camera is stopped, normal mode will resume. If the digital gain control is set to "9", flickerfree FR/A mode will be active even when the camera is stopped. If the video assist is supplied from the 12V battery using a cable with a 4 pin XLR connector, activation of the flickerfree FR/A mode will not depend on whether the camera is running. - Upper: Auto White Balance is ON. The white balance is adjusted according to the color temperature transition of the subject. This mode is suitable for shooting with variable lighting. - Middle: 3200K (fixed) - for indoor shooting under incandescent light. - Lower: 5600K (fixed) - for outdoor shooting on sunny days. The accessory connector which is installed on the side of the video assist is designed to supply power 12V DC, 600mA to LCD monitor. DIP switches located on the electronics board: By using the DIP switches located on the electronics board you can flip the image horizontally (mirroring) or vertically (upside down).